The Reserve Bank of Zimbabwe (RBZ) on Monday suspended four directors, just hours after the Finance Ministry's new communication tzar William Gerald Mutimunje, also known as Acie Lumumba, went on Facebook to accuse them of running a foreign currency cartel. In a rambling Facebook Live video Sunday evening, Lumumba named RBZ Director Bank Supervision Norman Mataruka, Director Financial Markets Azvinandaa Saburi, Director Financial Intelligence Mirirai Chiremba and Head of Security Gresham Muradzikwa, accusing them of crimes ranging from off-the-books bond notes to corrupt allocation of foreign currency. RBZ governor John Panonetsa Mangudya, in a statement, said the apex bank had noted the "allegations of impropriety", adding: "The bank has found it necessary, for the sake of transparency and good corporate governance, that the allegations be followed through and investigated in line with the bank's employment code of conduct." Mangudya said they had been suspended for an indefinite period to pave way for the internal investigation. According to Mutimunje, "Muradzikwa has more money in his bank account than all his bosses", while adding that he did not believe Mangudya was involved in the corruption. The directors had also made Finance Minister Mthuli's life "impossible", he claimed, adding: "I will not allow that. This country is being run by a cartel and Minister Ncube is going to break that cartel." Lumumba claimed to have access to financial intelligence provided to him during briefings with Ncube. RBZ sources told ZimLive that the directors were in the middle of bitter turf war for the control of the RBZ between President Emmerson Mnangagwa and his deputy, Constantino Chiwenga. Attempts were made to arrest the directors last week at the instigation of an anti-corruption unit established by Mnangagwa, but the plan was aborted after disagreements between security agencies, a source familiar with the events said. "The ZRP, Military Intelligence and Central Intelligence Organisation were all consulted on the plan, and there were bitter disagreements. In the end, no-one had an appetite to take such a drastic step before any wrongdoing has been established," the official said. In the background, Mnangagwa and Ncube, it is understood, have hatched a plan to break-up Trafigura Zimbabwe's stranglehold on the fuel industry. Fuel gets by far the biggest weekly foreign currency allocations at the RBZ, with the lion's share – some 70 percent – going to Singapore-registered Trafigura, which last year bought into Sakunda Supplies by acquiring a 48,79 stake through its South African subsidiary, Puma Energy Africa Holdings. Mutimunje, unleashed, accused Trafigura of running a fuel cartel. When it was time for the RBZ to release forex for fuel, executives at the apex bank ran around like headless chickens fearing the "fuel mafia", he claimed. He hinted that the alleged fuel cartel was using government protection through an exclusive agreement with the RBZ signed in 2016, and their near monopoly, to manipulate prices which were sharply higher than in the region although countries like DRC and Zambia get their fuel through Zimbabwe. Ncube believed the Reserve Bank should have no business running fuel allocations for private companies and wants protectionist policies restricting imports lifted to drive down prices, Mutimunje said. Mutimunje spoke just hours after Kudakwashe Tagwirei, the CEO of Trafigura Zimbabwe and owner of Sakunda, joined Chiwenga at his homestead in Wedza for a "thanksgiving mass." Chiwenga loyalists, almost exclusively from the Mashonaland Provinces, attended the event. Mutimunje claimed Zimbabwe was controlled by an individual he named as "Queen Bee", after the honeybee matriarch for whom all activities in the hive are for her benefit. He claimed he had met Queen Bee at the house of former Local Government Minister Saviour Kasukuwere a few times, and that this Queen Bee had also sponsored Grace Mugabe's rallies before her husband, President Robert Mugabe, was overthrown in a military coup last November. Two sources in the know told ZimLive that the individual Mutimunje was referring to was Tagwirei. "The mistake that many are making is to look at Mutimunje as an excitable irritant with no plan. On this occasion, he's the stalking horse of both Ncube and Mnangagwa. When the arrests failed, they chose to take it into the public domain, pretty much labelling the RBZ four as enemies of state. Mangudya was then activated to begin the internal inquiry," a source familiar with the manoeuvres said. On Monday, Chiwenga is said to have told Ncube to sack Mutimunje. A letter had been drafted, but the minister was reluctant to sign it. "An attack on Tagwirei is an attack on Chiwenga. They have other joint interests in chrome mining for instance. It's deeply personal and factional and there could be a lot more twists and turns on this saga," our source said. Former Central Intelligence Organisation boss Happyton Bonyongwe, his wife Willia – recently removed by Ncube from the Zimra board – and Bonyongwe's unnamed brother-in-law were also major players in the cartel, Mutimunje claimed. 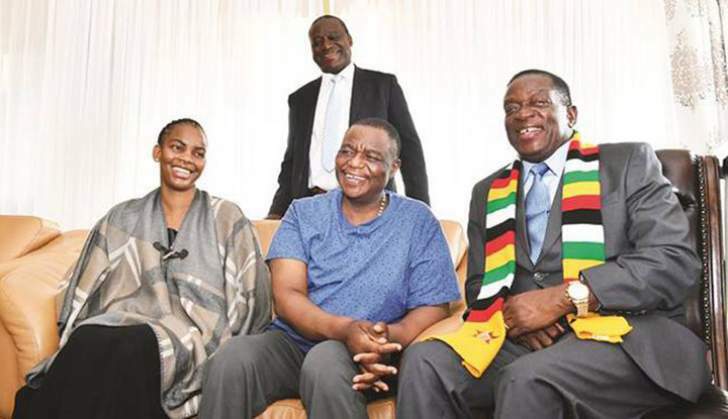 The Mnangagwa camp would try and link Tagwirei to Grace Mugabe, the reviled First Lady. Mutimunje hinted that Mugabe's frequent medical flights to Singapore was probably how money was being spirited away. He also insinuated that a private jet that flew Grace Mugabe in for her mother's funeral had been hired by Tagwirei, without naming him. Queen Bee, said Mutimunje, had realised that he could not "capture" Ncube and Mnangagwa so had gone about "capturing everyone else."